Now more than ever, companies have to renew them- selves. The overall acceleration of change processes requires a high level of flexibility from everyone involved in order to adapt to the continually changing conditions. Just being formed, teams get already restructured; the increase of Merger and Acquisition requires the merging of different company cultures and sometimes also different company values. “Die and become “, we hear sometimes and “A magic dwells in each beginning”. But often, this is not quite the predominant feeling. It is important, on many levels, to create new structures and offer a new “home” to the employees. In the diagnostic phase we look at the current situation. Where are we? A deep diagnostic phase makes sure that we do not only work with the symptoms, but that the spirit of the company as a systemic whole is understood and taken into account. Future scenarios must be worked out. Where do we want to go? Are we actively shaping our future or are we being shaped? On the level of change management now the overall concept and strategy must be developed. How do we get to where we want to be? On the psycho-social level, it is necessary to under- stand the employees’ hopes, fears and resistance and to “put them on the table”. The change process must be clearly and openly communicated in a transparent way so that rumours don’t occur. Changes mean new territory for all involved. Learning processes must be initiated so that the new territory is not perceived as threatening but as manageable. Finally, in the phase of implementation, it is important to test and review the new structures and to adapt them where necessary. And to celebrate what has already been achieved! We accompany your change process by strengthening and supporting your own resources. We offer a mix of various different approaches. They cover a range from analytical-structured methods like the SWOT-analysis on the one hand and artistic- narrative methods like Business Theatre on the other hand. Why are there so many change processes in companies that don’t achieve their defined goals? Quite often because the process didn’t reach the people. But they have to feel integrated if the slogan “human capital is our most important capital” is to be more than only a lip service. In our approach to change processes, executives and employees are confronted with their feelings, attitudes, resistance and expectations from the beginning. This happens through business theatre. Theatre allows emotions and needs to be expressed and felt, and thus to be discussed. Once on the table, they can’t be denied or played down anymore. We make sure that all voices in the company are heard and taken seriously -- and can thus be a constructive part of the change process. Through Business Theatre, large groups of up to 800 people can be reached and inspired to behavioural changes. The organisational development or the change process is managed in an integrated and interdisciplinary way. All employees and executives are involved in the entire process. Emotions and attitudes have their appropriate space. We use them constructively for the entire process. Thus, every one in the company works together and the measures have a long lasting effect which makes them more successful. 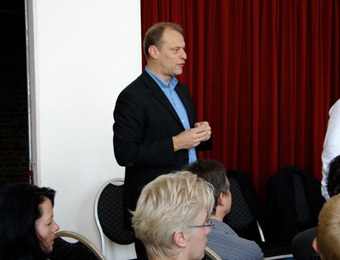 German Article: "Wo liegen die Parallelen zwischen Web, Change Management und Unternehmens-theater? Eine Analyse der Entwicklungen in den letzten 20 Jahren."